Celebrate the Truck Month at Newberg Dodge Jeep Chrysler Ram. This means you can get the New 2017 Ram 1500 Tradesman Crew Cab 4×4 for a Sale Price of $33,211*! Don’t miss out on these savings because they won’t last forever. Call 503-538-9444 or fill out the form on this page for more information. This truck is designed to work hard for you. It is built tough to give you the capability you need. You can see its large grille, capable lights and strong stance from blocks away. The New 2017 Ram 1500 Tradesman Crew Cab 4×4 also has the Class Exclusive available RamBox Cargo Management System to help you organize and store all the gear you need to succeed, and with the Available Remote Keyless Entry with Class-Exclusive Available AllSecure® Central Locking System, your job is even easier. The New 2017 Ram 1500 Tradesman Crew Cab 4×4 gives you the available Uconnect 8.4 or Uconnect 8.4 NAV. These systems have a full-color 8.4-inch touchscreen display and Bluetooth capabilities to keep you connected to your technology. There is also an available Wi-Fi hotspot so you can take the connection with you. 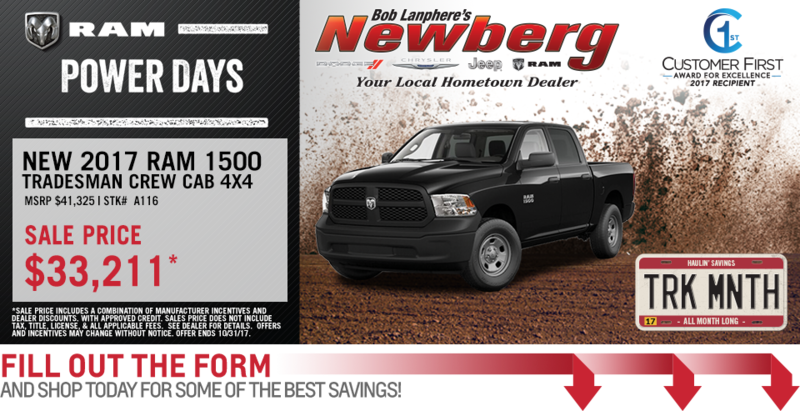 Check it out for yourself at Newberg CDJR. To test drive your New 2017 Ram 1500 Tradesman, call us at 503-538-9444 or fill out the form on this page. Performance isn’t something you want to have to worry about. With the New 2017 Ram 1500 Tradesman Crew Cab 4×4 you can count on performance. You can choose from the 3.6L Pentastar V6 engine, 3.0L EcoDiesel V6 engine and 5.7L HEMI V8 engine to get you where you need to be. Then, the TorqueFlite 8 eight-speed automatic transmission will help you with fuel efficiency because the transmission incorporates a thermal management system that optimizes Automatic Transmission Fluid temperature. *Sale price includes a combination of manufacturer incentives and dealer discounts. With approved credit. Sales price does not include tax, title, license, & all applicable fees. See dealer for details. Offers and incentives may change without notice. Offer ends 10/31/17.